It should come as no news to anyone that access to fresh produce and quality food is a good indicator of overall health. It is further not surprising that poverty and food insecurity are strongly linked. If you do not have the financial means to pay for fresh food, it is likely your diet will consist of fast food, packaged and processed foods, and frozen meals. If you live in a “food desert”, whether you can pay for produce or not doesn’t matter because there isn’t any for you to buy. There is more and more evidence that this can become a vicious cycle as well. You or your family is at or below the poverty level, and the only places you can afford to live lack access to food and the money to pay for, and this contributes to poor nutrition and obesity, which in turn may stifle earning potential and opportunities further. The issues of poverty, food insecurity, and the increasingly wide-spread and frightening rise of obesity, diabetes, hypertension, and other ‘lifestyle diseases’ has been on my mind more and more. It seems we have lost our way, as a country, and things keep happening to make it seem worse and worse. How do we keep ourselves, our family, and our children fed and healthy, without going over budget? It is a long road, and not an issue I can tackle and solve myself. But I can try to do small things to help. Like creating as healthy of a meal plan as possible that would be relatable to the people who need it the most. 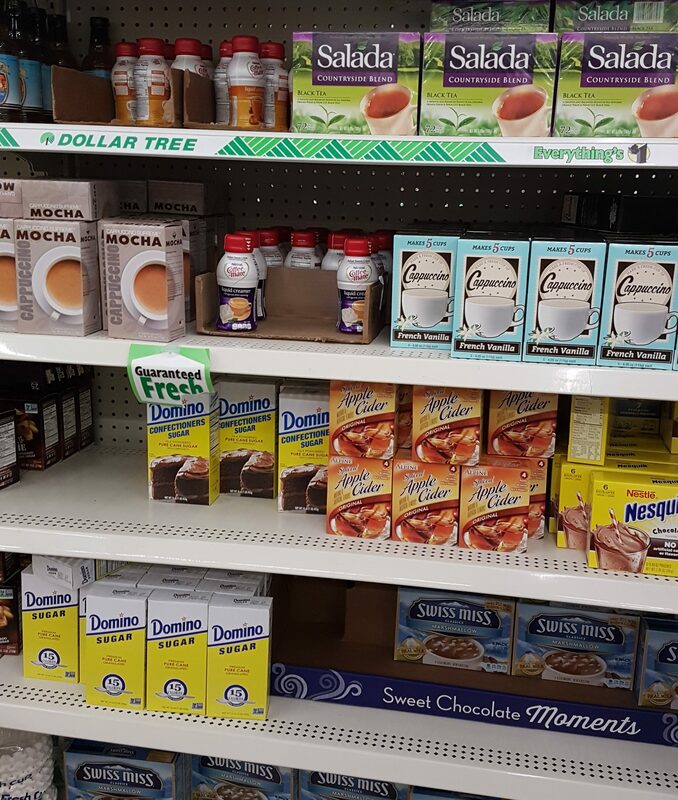 So I went to my local Dollar Tree to scope out the options. Most households in America, even if they are not near a grocery store, should be within walking or bus distance of a Dollar Tree or Dollar General or similar type store. 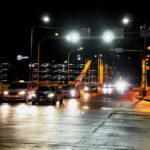 I figured this would be a good base to work with, and provide the best ‘bang-for-your-buck’ that most people on a very low income are looking for. 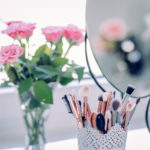 Let’s be real, even as a dual income family with more than enough room in the budget to not have to care what we spend on food, we still care a lot, and stick to a budget. We are all potentially just one disaster away from poverty. 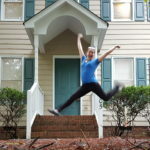 Whether you are a single mom or dad trying to feed your growing family on a part-time income, a struggling college kid paying your way with a scholarship, part time job, and a ridiculous loan, a newly married couple just trying to figure out how money works, or a retiree on a fixed income, I hope that this information can be helpful. 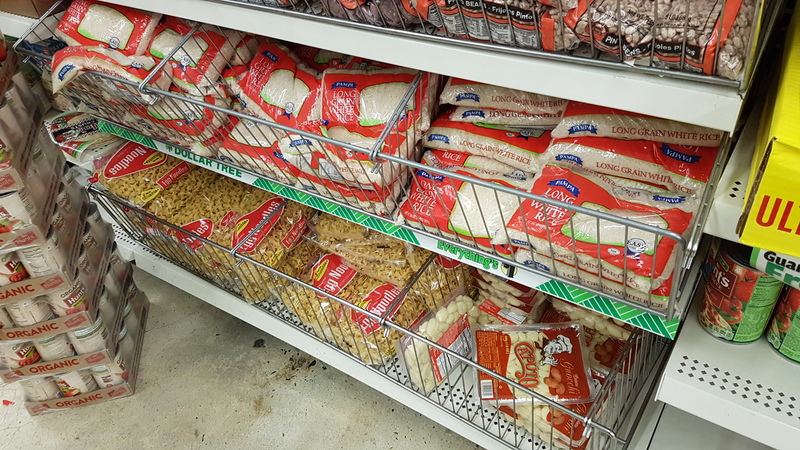 If the store has a frozen section, this can be a great place to start. Though there will be options to avoid (I’ll mention more about that next) you will be most likely to find the healthiest choices here with frozen fruits and vegetables. Produce that is frozen is usually picked at the peak of ripeness, and then flash frozen for storage and transport. Though it isn’t right out of a field, it will still contain much of its original nutrition, and sometimes even be more nutritious than fresh, similar produce. Frozen fruit makes a great snack, addition to smoothies, or are perfect to add in to oatmeal for a filling and healthy breakfast or anytime meal. When it comes to potatoes, just be careful about the ingredients and amount of added fat. French fries are still fries, even if you make them in your own oven. Frozen vegetable blends are my personal favorite. They are great to heat quickly in the microwave as an easy side dish, you can mix onion and peppers into scrambled eggs, top baked potatoes with broccoli, add mixes to soup and stews and tacos, or toss into stir fry. Try to eat at least 5-7 servings of vegetables every day. A serving is about 1/2 cup frozen, or about 1/6 of a bag of frozen vegetables. 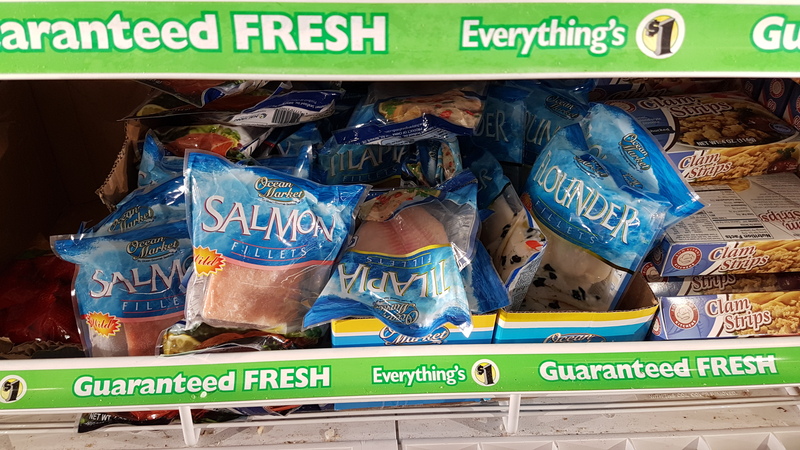 I noticed at my store that they had frozen fish filets as well. Salmon, tilapia, and flounder were on offer. I can get into all the details about how to choose sustainable fish, but at this level I think any fish is a luxury and you don’t care where it came from, as long as it’s cheap. Fish does provide lots of lean protein, and is a great source of omega 3 fatty acids. Fish is also an important protein in the Mediterranean diet, and a far better choice in general than red meats, or even lean meat like chicken or turkey. So if you are able, add one to two servings of fish per week to your diet. 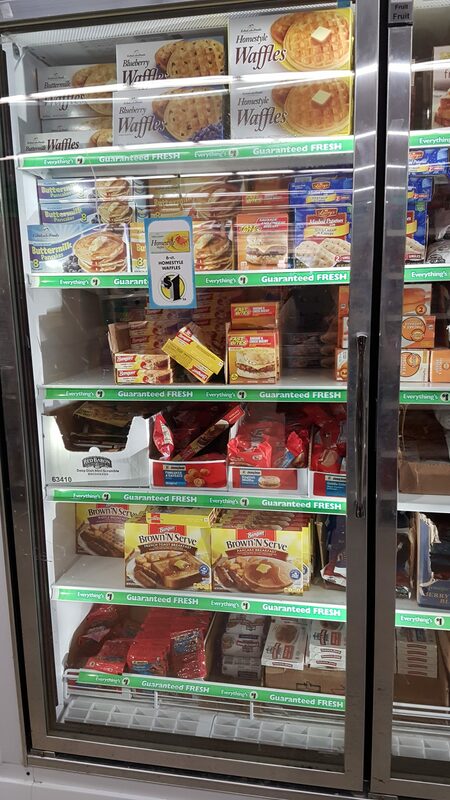 This is an example of some of the less desirable frozen food options, nutritionally speaking. Pancakes, biscuits, and waffles can be made healthy if you make it yourself from whole grain flours, but these pre-made and frozen options are likely full of preservatives, high fructose corn syrup, and other ingredients you don’t want. Try instead this simple blender pancake recipe, this slightly healthier one with added banana and oats, or this one with only 3 required ingredients. Even the box of mix from the store with some milk or water would likely be healthier. 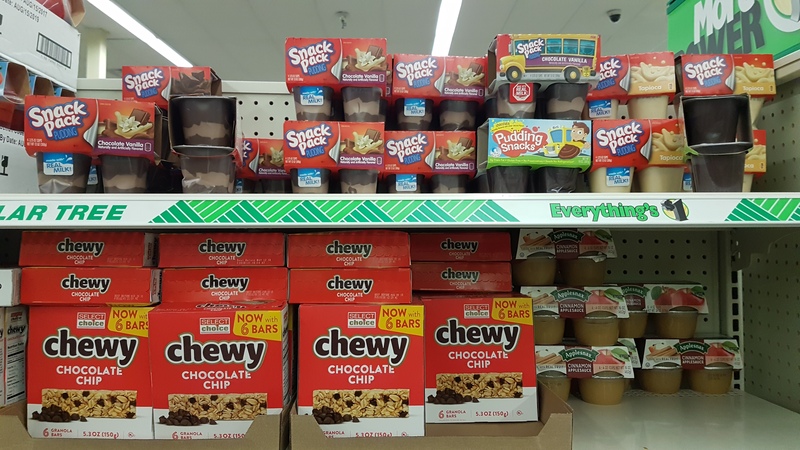 Pudding and granola bars may seem like a good ‘convenience’ item to pack in lunches and have on hand for breakfasts or snacking. But be wary of the sugar content. Some granola bars can have a sugar content equal to or greater than a candy bar! You can easily make your own granola bars too using just oats, honey, peanut butter, and maybe some bananas or dried fruits or nuts. The best news is that oats are generally pretty cheap too, so per serving regular oatmeal for breakfast, granola bars, or plain baked granola are really affordable options. 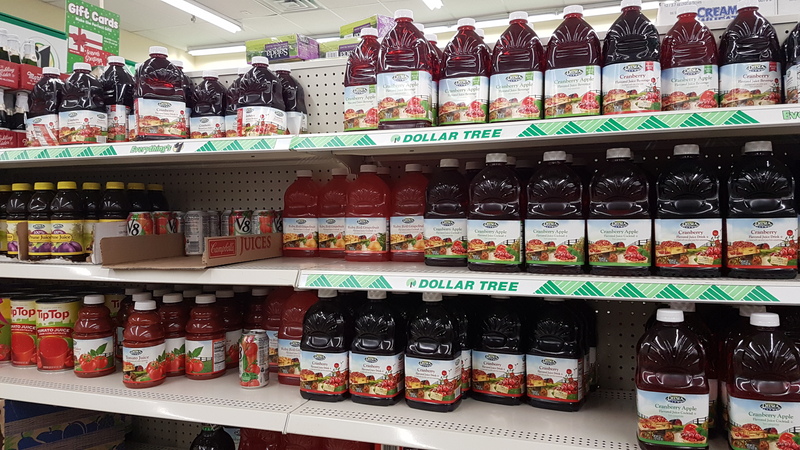 There are a lot of packaged beverage options, especially juices. Kids in particular tend to adore juice, at breakfast, after school, with dinner, before bed… but you need to be careful of the sugar content. Many juice types these days is only 5% actual fruit juice, if that! They are instead colored and flavored sugar water, with the vast majority of their calories coming from high fructose corn syrup. The healthiest beverage, always, is water. And the best part is, water is free from the tap! If you are trying to get your kids (or yourself) to drink less juice, for health or financial reasons, try diluting it with water slowly over time. Pour one glass of juice, about 80% full, and top it off with water. Then work your way to half and half. Eventually you have a glass of water with just a splash of juice for flavor. Another good source for fruits, if you don’t have access to fresh produce or it is not in season, is canned fruit. 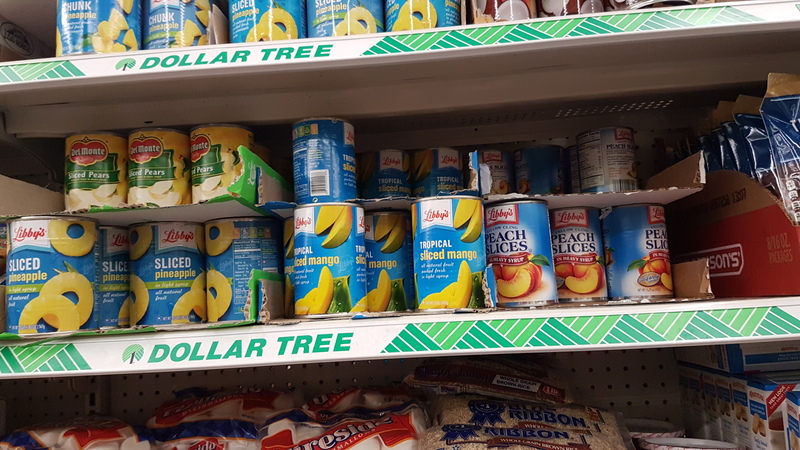 I most often see canned pears and peaches, but I also saw pineapples and mandarin orange slices. These are all awesome snack or side options. It is best to choose “packed in water” or “packed in its own juices” over “canned in syrup” or heavy syrup. It is worth glancing at the ingredients list as well, and the total sugar and calorie content. 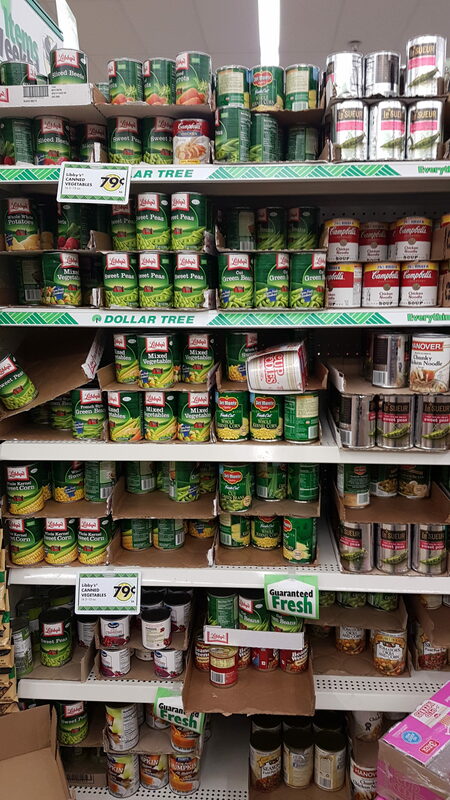 Canned vegetables are another good choice in lieu of fresh produce. 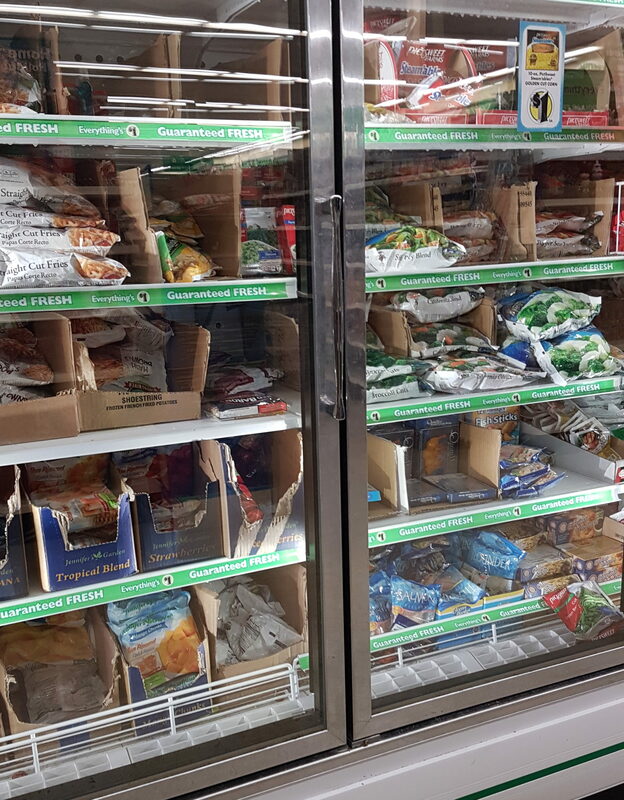 Cans last even longer and store better than frozen options, and better yet do not require a freezer or electricity. Canned vegetables tend to be overall pretty healthy, just check the sodium content. Similarly with canned soups, check the salt levels. Some can contain nearly 100% of your daily recommended sodium in one serving. 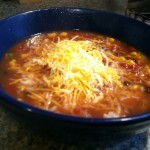 Canned corn can be tossed into soups or burritos, or eaten with some butter and salt alone as a side dish. Canned green beans make a similarly easy and delicious side, can become casserole, or be tossed into minestrone or veggie soup. Canned beets are surprisingly delightful on salads, or even eaten plain. And plain canned pumpkin is a great baking option, it can be mixed into waffles, pancake mix, cakes and pies and cookies. Pasta, a definite frugal food favorite. At some grocery stores you can find it even cheaper, 0.95, 0.88, or even 0.50! But here, everything is a dollar. 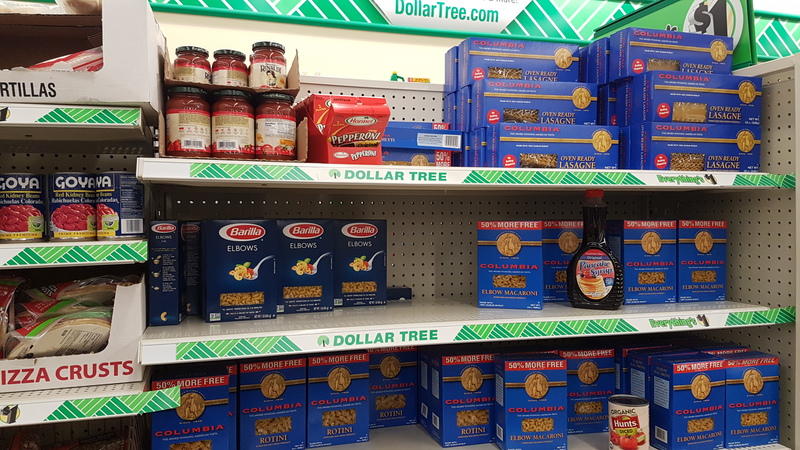 That doesn’t change the fact that when money is super tight, pasta becomes a life-saver. Maybe literally. Pasta can be made healthier by pumping it up with extra vegetables. 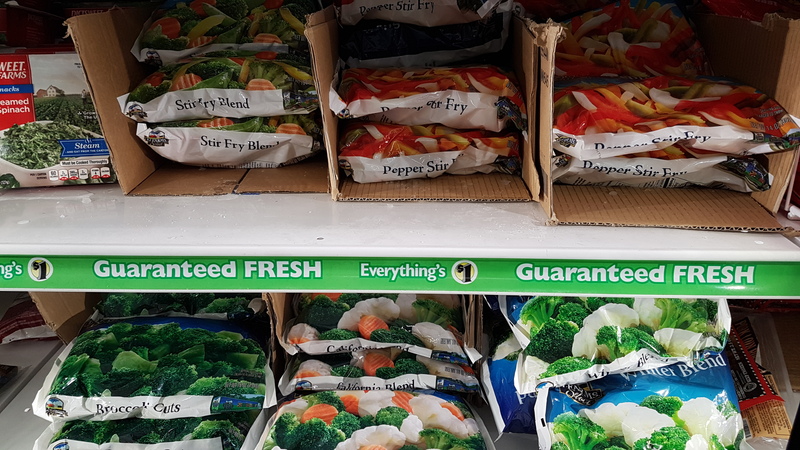 It goes well with just about any frozen mix you can find, and most canned vegetables as well. Just dump the veggies right into your pot with the pasta during the last 3-4 minutes of boiling. If you want to be sneaky healthy and have a blender, you can also blend canned or frozen veggies or beans into the sauce, and no one will even know! And where would pasta be without its best friend, sauce! Most people cannot fathom one without the other. The good news is that pasta sauce is relatively good for you, since tomatoes actually become more nutritious after cooking. You’re better off just simmering a can of diced tomatoes as your sauce, and adding any spices you enjoy such as Italian seasoning, thyme, basil, garlic salt, etc. 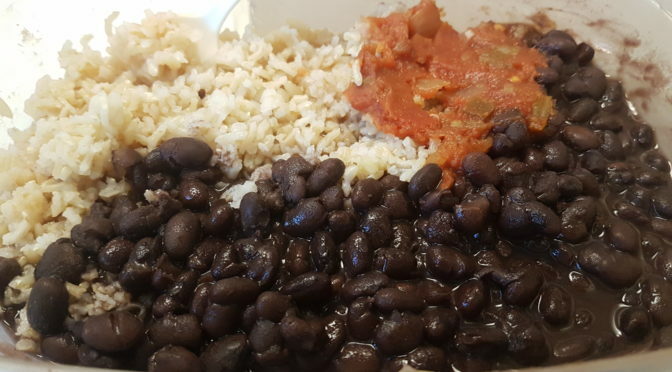 Dried beans and rice are classic frugal favorites, and for good reason. Beans are a powerhouse of nutrition, containing lots of micronutrients, magnesium, iron, protein, and tons of great-for-your-gut fiber. 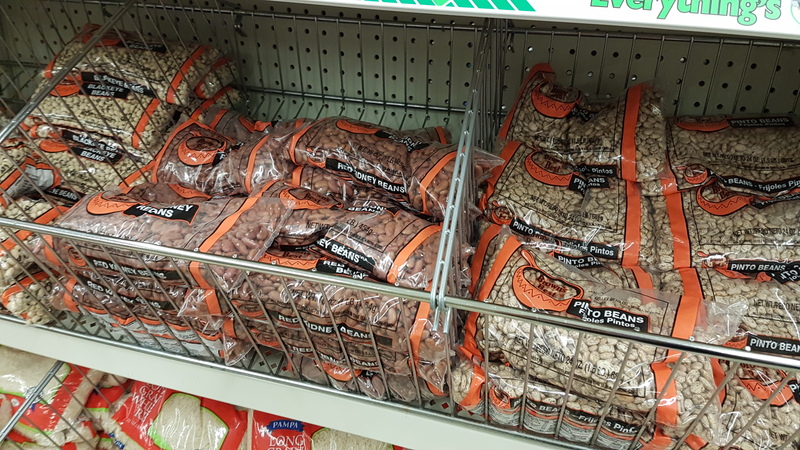 One cup of dry beans plumps up to 2-3 cups once cooked, giving you even more value for your money. The same can be said of rice, white or brown, which provides 200-250 calories per cup for roughly $0.10. To cook beans from dry, you simply let them soak in water overnight or for 8 hours, then change the water and boil them for a few hours, until soft. Or cook them in a crock pot, if you have that luxury. Now that you have cooked beans, layer as many different types of beans as you can find into a hearty chili, toss them into tacos and burritos and enchiladas, whirl them in a blender to make homemade hummus, or cook up some hearty red beans and rice. Ah, rice. The food all frugal foodies sing praises to. And for good reason as well. Rice is cheap per pound ($1/lb here, you can get it much cheaper in bulk but also sometimes you just can’t swing $15 for 25 pounds) but delivers tons of carbs (aka ENERGY) and a nice punch of nutrition in return. You can easily have a full week of meals for a dollar or two and a couple minutes of simmering. To cook rice, simply mix rice and water in a one to two ratio (for example, 1/2 cup rice + 1 cup water) and bring to a boil. Once boiling, cover with a lid and simmer 20 minutes. That’s it! It is also super easy to cook, as noted, and ridiculously versatile. It can bulk up just about any meal to make it stretch: burritos, tacos, soups, stir fry, casseroles, curry… It is also the partner in crime to the other frugal foodie favorite, beans. Try adding some to bulk up vegetable soups, add some simple spices and a can of tomatoes, corn, and/or beans for Spanish rice, or mix with frozen broccoli and some cheddar cheese for a delicious side dish or casserole. 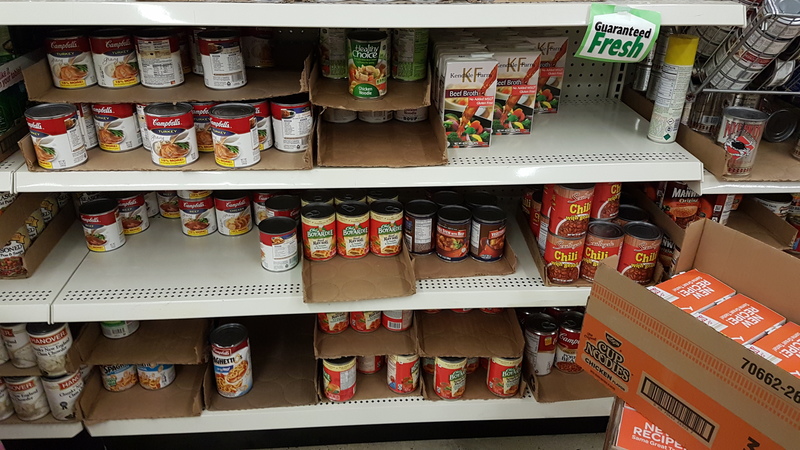 Canned ravioli, Spaghetti-Os, and chili is not the best bet, they will have sky-high sodium, but if you are desperate for protein in an easy-to-open and store container, you could do worse. I would highly recommend making actual pasta rather than go for the cans, especially for double the cost (1 box pasta + 1 can sauce vs 1 can of spaghettios). You get way more than double the food; more like 5 times as much! As for soup stock, you can make your own for almost free! Just save vegetable scraps like potato and carrot skins, the ends of onions and celery stalks, pits of peppers and tomatoes, in a bag in the freezer. Once you have enough to fill a pot, cover with water and bring to a boil. Simmer for an hour or so, and strain the solids out. That liquid is pure homemade vegetable stock! You can use it to make soups, to fry instead of oils, and to cook rice in for extra flavor. 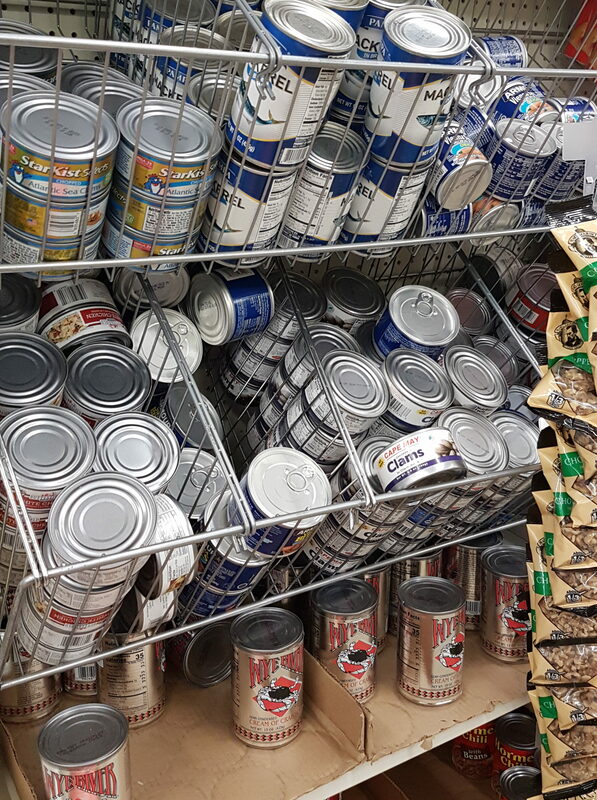 Canned fish is definitely a great low-cost protein option. When you are on a seriously-ridiculous-bare-bones budget, you cannot worry about needs as high up the chain as ethically sourced mercury-free fish. You just want cheap sources of proteins. Canned tuna and salmon makes great sandwiches, tuna noodle casserole, or latkes. 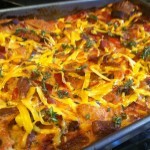 Flake it over a salad or into any pasta dish, even adding it to soups or casseroles. Canned clams can make a frugal knockoff clam chowder, clam linguini, or top a pizza with them. Boxed mac n cheese has all kinds of additives, fake cheese-like product, preservatives, and colorants. You are better off cooking a box of actual pasta, and adding in a block of actual cheese to make your mac n cheese. But if even $3 is out of your price range (1 box pasta + 1 block cheese + 1 bottle milk) then the boxed kind will keep your belly full for a while. Boxed pasta salad mixes are also not really worth the “extras”, which includes anti-caking agents, dehydrated flakes, “flavoring”, etc. Just make a box of pasta, and add a bag of frozen peppers & onion mix. If you have one more dollar, get Italian dressing and mix it in too. It will taste better and be better for you, with actual vegetable pieces. 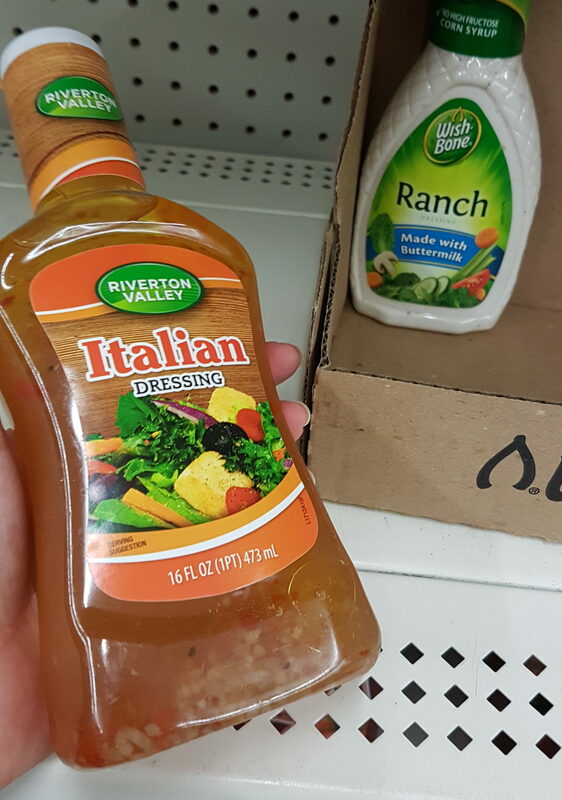 As mentioned above, if you have enough wiggle room in the budget to add dressing, Italian is my favorite. It is very versatile, bringing flavor to pasta salads, actual lettuce salads, or roasted chicken. 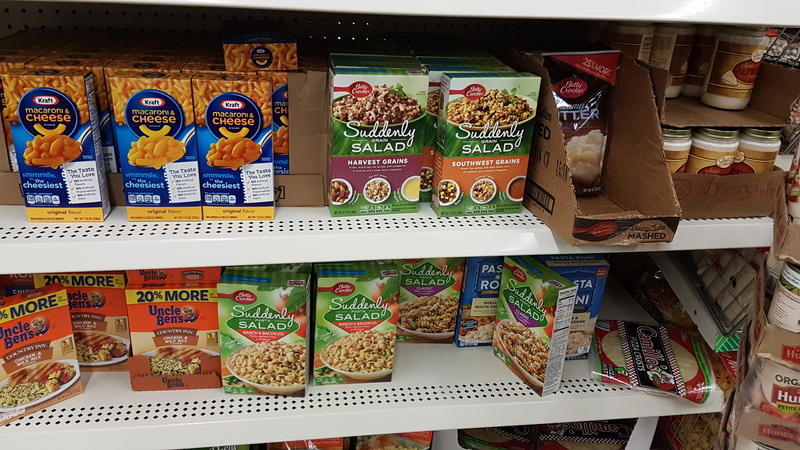 The Dollar Tree does not have any fresh produce, so we won’t have any real salad to go with it… but it does perk up pasta salads well, and is great over steamed frozen veggies. 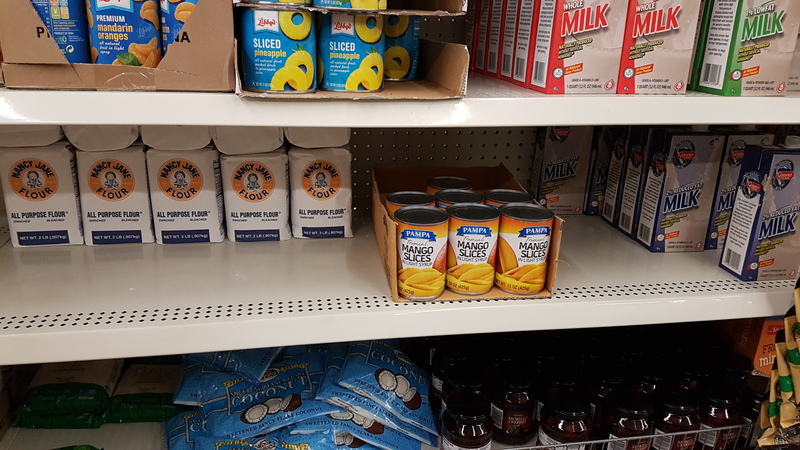 For your baking needs, they do have smaller packages of salt, sugar, flour, and even shredded coconut. If I was on a super-tight budget, shredded coconut would not top my list. But if you have room and enjoy its taste, it is a great addition to oatmeal, soups, and baking. Flour and water together can lead to your own super-frugal tortillas for your bean and rice burritos. You can whip up you own naan for scooping curry and chili. 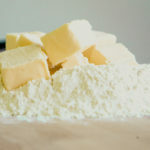 And if you can get ahold of any yeast, or a fermented sourdough starter, you can be well on your way to homemade bread, biscuits, pizza dough, and rolls as well. For $1, this is a decent size jar of jelly. 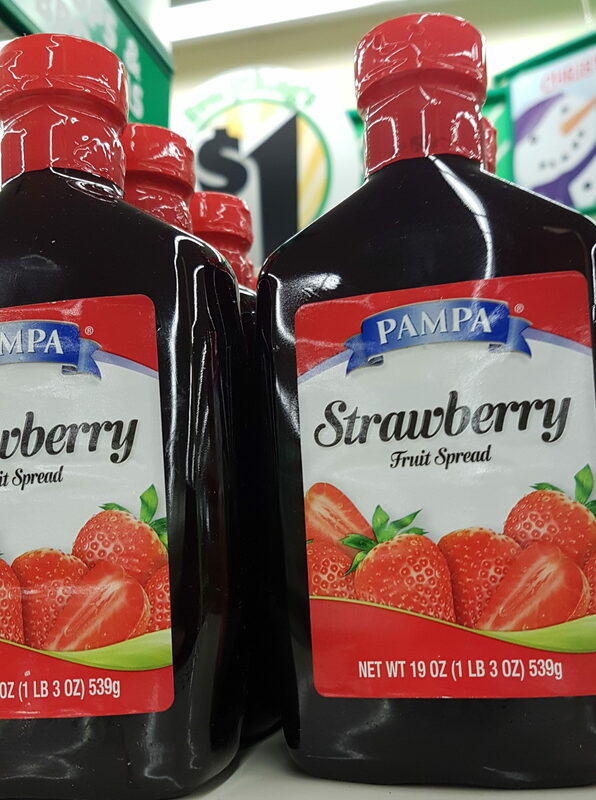 It makes me cringe just a little to see the high fructose corn syrup and how much sugar per serving is in there, jam made with actual fruit would be so much better. But, again, this is about survival. Food that will fill bellies and keep kids happy (or yourself) while keeping the lights on and gas in the car. So when a PB&J is the compromise, you need the J part. 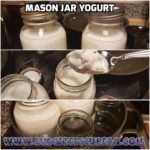 It can also make a great topping for biscuits, toast, or pancakes. And of course the PB part of a PBJ. I was a little disappointed to see how small these jars were… 10 oz compared to jelly’s 19 oz. Can you tell we subsidize corn syrup in this country and not peanuts? Oh, and if you have peanut allergies, well, tough luck. 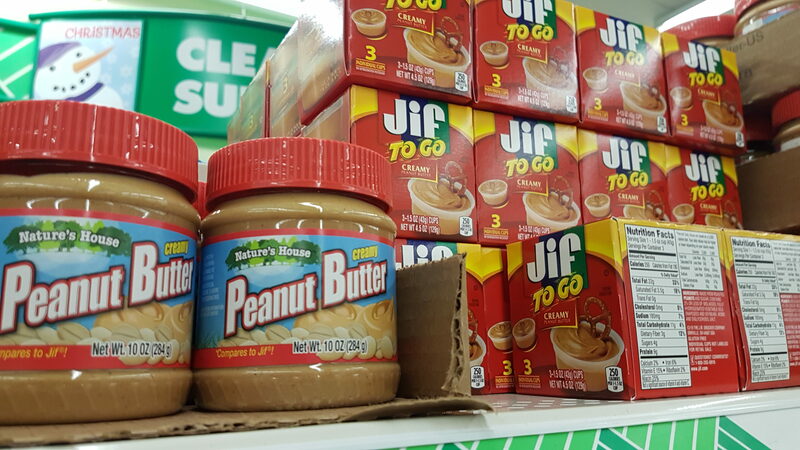 There is nothing fancy like almond butter or sunbutter options here. I was pleasantly surprised at the wide variety of bread options! Obviously, making your own without sugar or preservatives is healthier. But who has time for that nonsense between jobs and childcare? 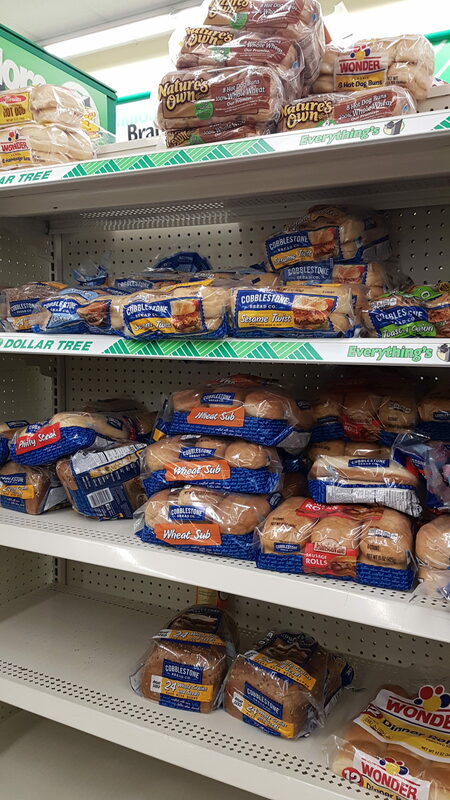 At least you can choose whole wheat bread and rolls, and they even had a really nice looking multigrain option. For $1, this is actually much cheaper than a regular grocery store. If you’re on a very limited budget, I highly recommend you switch to water as your main, or only beverage. Actually I recommend that in general. 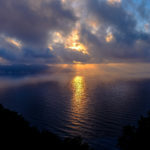 Water is the healthiest liquid you could drink, and has the added benefit of being free and clean from your very own tap. 24/7. However, sometimes a warm or sweet beverage can be a needed pick me up, and I get that. 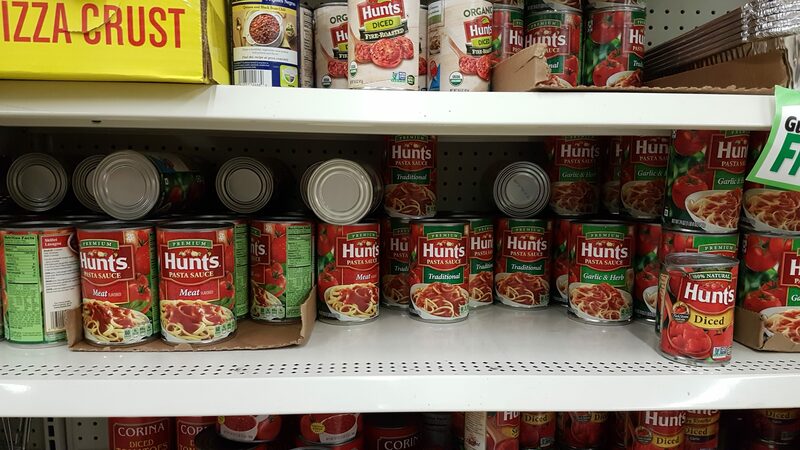 I noticed they had pre-cooked pizza crusts, and pizza sauce and small pepperonis. Any processed meat like sausage, pepperoni, etc. is not the best. But if you are going to have pizza anyways, making your own is FAR healthier and cheaper than going out. Even a $5 hot-and-ready is $5 compared to $3 to make your own. 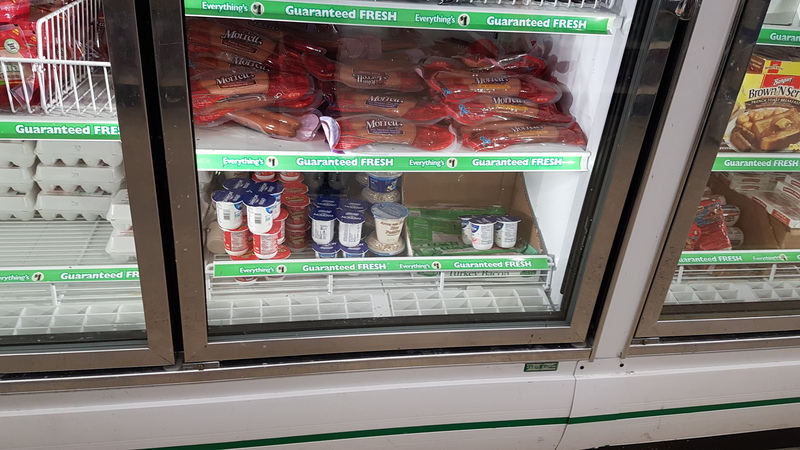 In the refrigerated section, you will find 8-count eggs and yogurt. If you and your family does eat dairy, a 4-pack of yogurt for $1 is a pretty good deal, and will provide calories and some protein. Eggs are a good cheap source of protein. Though sometimes you can find better deals at ‘regular stores’, we are assuming there isn’t one. I designed this plan to serve 2 people with average adult appetites for 3 meals for 7 days. This may not apply to you, and you may need to change the amounts a little if you have little kids, or hungry teens, or a large family, or more or less meals per week to provide. Scale up or down accordingly. It is also designed with the least amount of cooking required as possible, which is not the best financial move. But I understand that when times are tough and time is tight, making things from scratch is not the priority. 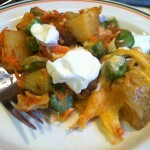 L – Chili mac! Top leftover macaroni with leftover chili. Very filling. B – Leftover pancakes – you can pop them in the toaster to reheat! D – Pizza night! To make it extra healthy, microwave a bag of frozen mixed vegetables and drain. Top pizza with sauce and veggies, then bake at 350 for 20 minutes. Vegetarian chili: 2-3 cans different beans (or ~4 cups from dried), 1 can diced tomatoes or bottle tomato juice, chili powder = $4. Put all ingredients in a slow cooker on low 6-8 hours, or simmer on stove top for about 1 hour up to 4 hours, stirring often to prevent burning. Macaroni and cheese: 1 box pasta, 1 block cheese, 1 small jar milk = $3. Boil pasta noodles and drain. Return noodles to the pan, add the cheese (cutting into smaller pieces or shredding will help it melt faster) and 1/2 cup milk. Stir on medium heat until cheese melts. You can also add a bag of frozen mixed veggies for extra nutrition. Either drain a can of fruit & chop into small pieces, or microwave 1 cup of frozen fruit and drain. Add to the pancake batter in place of some liquid. For example, if you need 1 cup of water, add 1 cup fruit and about 1/3 cup water instead. Adjust liquid to your desired batter thickness. Cook on hot pan or griddle until brown, flip and cook the other side. Red beans & rice: Cook 2 cups rice, cook 2 cups beans (or 1 can pinto /kidney), optional 1 cup frozen pepper & onion mix = $3. The key to this one is to simmer on low for a long time. It makes the beans break down a bit and thicken, add some chili powder for extra kick. Pasta with sauce & veggies: 1 box pasta, 1 bag frozen mixed veggies, 1 can pasta sauce = $3. Boil pasta according to directions, add frozen veggies at the last 3-5 minutes to thaw. Drain, add sauce. Pizza: thin crust, bag pepperoni, (optional) mozzarella cheese sticks or shredded cheese, can of sauce = $4. 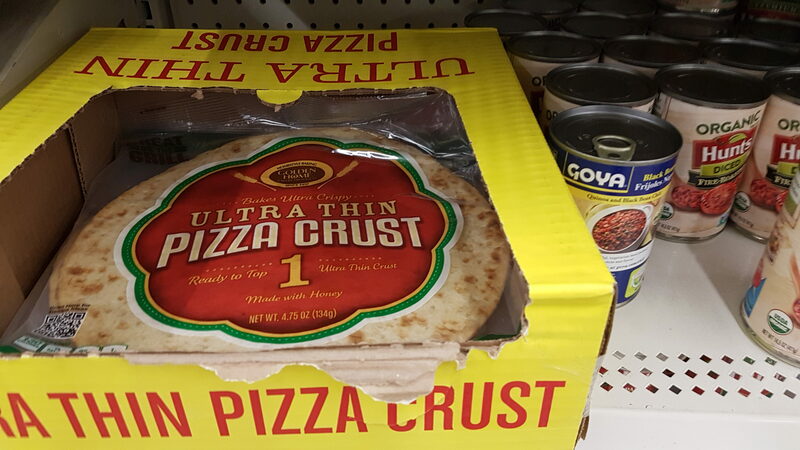 Top crust with sauce, toppings, and cheese if using. Bake at 350 for 20 minutes. Stir fry: rice, frozen mixed veggies, 2 eggs = $3. Cook 2 cups of rice and set aside. Microwave or boil veggies to thaw and cook. Scramble 2 eggs, and mix into the rice. Top with veggies. Soy sauce optional. Tuna noodle casserole: 1 can tuna (drained), 1 can cream of mushroom soup, 1/2 box pasta: $3. Mix together and either bake at 350 for 20 minutes or just stir together while pasta is still hot. For extra nutrition, add a thawed bag of frozen mixed vegetables. And there you have it, 3 meals per day for 7 days for 2 people, or 42 meals for just $27 or just 64 cents per serving. You can also at any point make a big pot of vegetable soup with a bag or two of frozen mixed veggies and stock or water. Bring to a boil and simmer for 20 minutes to a few hours, adding whatever spices you like. 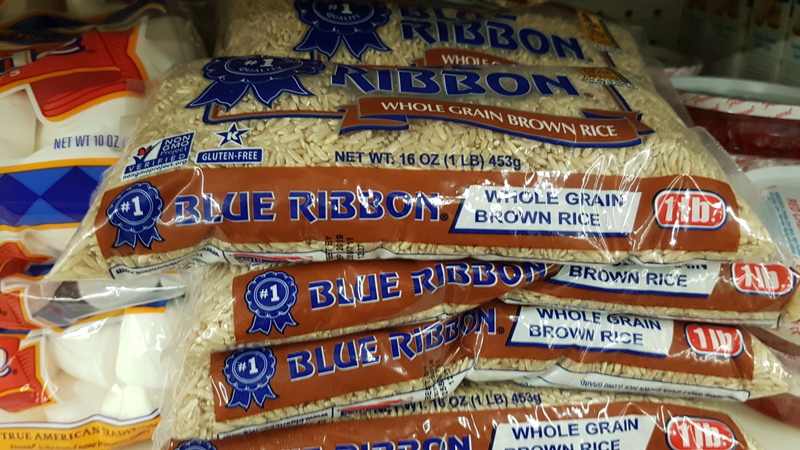 This can be easily just a few cents per serving, and you can add rice and/or beans or serve with bread/rolls to bulk it up further. Yes, it is quite carb heavy and not the healthiest ever. But you have to do what you have to do sometimes. And sneaking in some canned fruits and frozen veggies is better than pop-tarts, or nothing! Please share with the class! 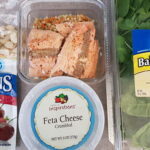 What are your classic frugal meal ideas? Have you ever experienced hard times? Is this at all realistic and useful?